Our reverence and focus on the animal causes us to pause briefly and wonder why more people don’t participate in the experience of truly knowing what it is they are eating. One issue in northwest Michigan, and in the state as a whole, is that we simply don’t have a sufficient quantity of protein producers. The main issue seems to be historic. Once the feedlot scale of beef and pork production started there was no turning back. And now we’re faced with corn-fed animals that consume a commodity whose market is mainly grown in states like Iowa and Nebraska. How do we manage our own protein production when we’ve created a production cycle that’s untenable economically? This question and more were posed during the bonus day of Pigstock 2013. Creator and passionate local businessman Chip Hoagland coins this bonus day “Beefstock.” This add-on day is designed to examine our potential in this region for expanding our protein production and our capacity for processing. Mainly the time was spent with a panel presentation led by Hougland and featuring regional experts of parts of the food system; Nels Veliquette, Don Coe, Dan Hubbell, Rory Royston, and Jason Rountree. The following are my rough notes from that panel discussion. 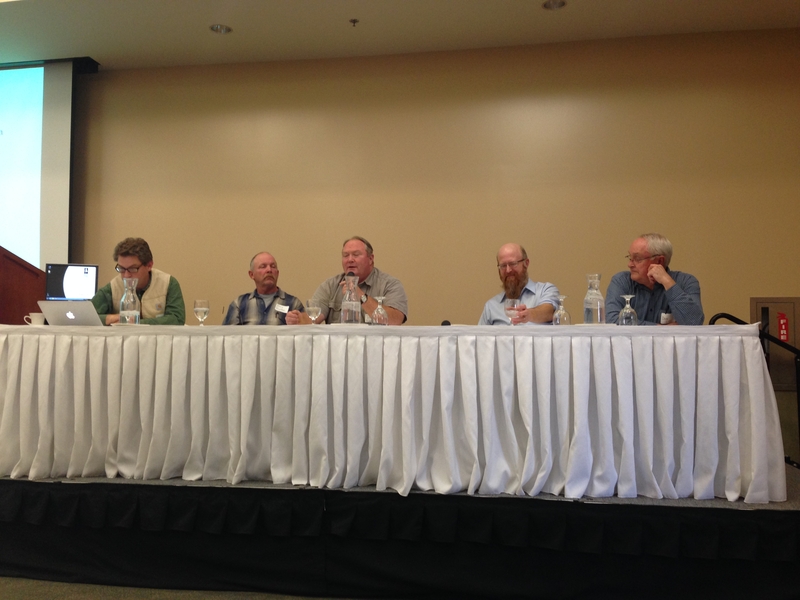 Jason Rountree, Rory Royston, Dan Hubbell, Nels Veliquette, and Don Coe sitting on the Beefstock TC panel on October 24, 2013. He stressed that capital is of course needed as well and, that while still available, lenders have tightened up their purse-strings significantly. Don Coe is co-owner of Blackstar Farms in Suttons Bay, MI. He’s also been a long-time member of the Michigan Ag Commission. Don reminded the audience that post-war the region supported over one hundred dairy farms. That number is significantly lower today. To find out more about Don Coe and Blackstar farms click here. Fred Laughlin, Director of the Great Lakes Culinary Institute, chimed in to describe why local protein production is challenged in the current market. He said the key issue is the expectation of consistency created by the feed-lot production cycle. Today restaurants, institutions, and consumers all expect a certain quality of meat that is defined largely by corn-fed animals and the absolute uniform quality of provided cuts. “We simply can’t get the cuts our customers want in quantities we require from local production.” His suggestions are to find a way back to the model from 50 years ago, when institutions were all expected to take their protein shipments on the hoof, or at least by the carcass. This required them to break up the animal themselves, and to use every part of the carcass. He reminisced about a time when most restaurants had their own meat lockers. He also added that taste and quality of the cuts is vital to success. Find out more about Fred Laughlin and his Great Lakes Culinary Institute here. Dan took on a more realist tone when discussing the local food movement. He said, “I’ve seen at least three local food movements in my time, one during the 70’s back to land era, one during the 1980’s and 1990’s, and the one we’re in today. As in the other two, I predict the failure of this food movement. So many farmers today have off-farm jobs just to get by. How is that going to be sustainable?” Find out more about the Hubbell Farm here. Rory Royston is owner of RRR Meat Processing in Buckley, MI. He told a bit of the history of the processing industry, and how it was at one point regional. “There were small to large packing houses everywhere, so people didn’t have to travel distances to process animals.” Today all that’s changed. Most meat we find in grocery stores today comes from a small handful of processing facilities in the midwest. He brought up Don Coe’s point about losing institutional knowledge, saying that he’s hired people with 30 years experience as butchers who have never completely broken down an animal. He says today, most butcher shops get their meat pre-processed into sections so that they’re really only cutting them into smaller pieces. It’s getting increasingly difficult to “fight the game” represented by Gordon’s and SYSCO. Jason Rountree is MSU’s Assistant Professor for Beef Cattle and Forage Utilization. He’s running a large-scale research project to determine the best methods of grass-fed beef production in northern Michigan. Rountree shared statistics of midwest farming and that they’ve lost 50% of their topsoil in the last 50 years. His question to us is “What kind of agriculture do we want here?” Jason’s approach to the protein question, as a researcher, is heavily scientific. He’s been looking at what it takes to grow commercially viable beef in our climes. Part of this equation is in settling on grass-fed versus corn-fed production. He emphasizes the efficiency of protein production as a critical factor for future sustainability, quoting research that current feed-lot beef production methods require 14 calories of oil input for every calorie put on the plate. Rountree says responsible farmers and consumers we should be concerned with the worth of carbon and water, community enrichment, and with reestablishing biodiversity. However, he says, we also need to be concerned with profitability. While across the U.S. incomes have doubled for most of the population in the last two decades, that is not true for farmers. Find out more about Jason here. The day ended up with informal conversations over lunch served at the Hagerty Center. The entire Pigstock/Beefstock series of events is an invaluable contribution to our discussion and understanding of our place in the food system. Be sure to put this week on your calendar for next year.